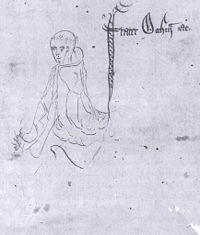 William of Ockham - Sketch labelled "frater Occham iste," from a manuscript of Ockham's Summa Logicae, 1341. William of Ockham (also Occam or any of several other spellings) (c. 1285 – 1347) was an English Franciscan friar and scholastic philosopher, from Ockham, a small village in Surrey, near East Horsley. He is best known for his contributions to nominalism and his principle of parsimony known as "Ockham's razor." Though the concept of parsimony in reasoning was not necessarily invented by William of Ockham himself, his frequent and decisive use of the razor attributed this principle to him. He utilized the razor to arrive at the most essential pluralities and variables of an argument, which he thought to be reason, experience and some infallible authority (according to his faith and scripture). While the use of Ockham's Razor in the later development of philosophy has been decontextualized out of its original theological context, the strength of William of Ockham's philosophy and logic can be attributed to the clarity with which he utilizes the razor to ground his reasoning in his faith. Ockham joined the Franciscan order while still very young and was educated first at the Franciscan house in London and then at Oxford. He did not complete his studies at Oxford, but it was during this period and the years immediately following that he wrote most of the philosophical and theological works on which his reputation primarily rests. His ideas very soon became the subject of controversy. The earlier scholarly consensus that he was summoned to Avignon in 1324 by Pope John XXII on accusation of heresy, and spent four years there in effect under house arrest while his teaching and writing were investigated, has recently been challenged. He may in fact have been sent to Avignon in 1324 to teach philosophy at the prestigious Franciscan school, and made enemies among scholastic competitors, especially the followers of Thomas Aquinas (who had been canonized by John XXII one year before Ockham's arrival), some of whom accused Ockham of teaching heresy. There is evidence that it is not until 1327 that he was actually summoned before the Pope to answer charges made earlier by a commission of experts (without Franciscan representation), but no house arrest followed this exercise, with the Pope reserving judgment. Sometime after April 9, 1328, at the request of Brother Michael of Cesena, head of the Franciscan order, he investigated the controversy between the Franciscans and the Papacy on the doctrine of apostolic poverty, which had become central to Franciscan doctrine, but which was considered highly dubious and possibly heretical by both the Papacy and the Dominican order. He concluded that Pope John XXII was a heretic, a position that he later put forth in writing. Before a conclusion was reached about the heresy or orthodoxy of Ockham's own philosophy, he fled Avignon on May 26, 1328, with Michael of Cesena and a few other friars. They eventually sought the protection of Emperor Louis IV of Bavaria. After his flight from the papal court, Ockham was excommunicated, but his philosophy was never officially condemned. He spent much of the remainder of his life writing about political issues, including the relative authority and rights of the spiritual and temporal powers. He became leader of the small band of Franciscan dissidents at Louis' court in 1342, after the death of Michael of Cesena. He died on April 9, 1348, in the Franciscan convent in Munich, Bavaria (now Germany). He was posthumously rehabilitated by the official Church in 1359. His feast day is April 10. Ockham has been called "the greatest nominalist that ever lived," along with Duns Scotus, his opposite number from the realist camp, one of the two "greatest speculative minds of the middle ages," as well as "two of the profoundest metaphysicians that ever lived" (Peirce, 1869). A pioneer of nominalism, some consider him the father of modern epistemology and modern philosophy in general. One important contribution that he made to modern science and modern intellectual culture was through the principle of parsimony in explanation and theory building that came to be known as Ockham's razor. This maxim states that one should always opt for an explanation in terms of the fewest possible number of causes, factors, or variables in order to arrive at the most accurate theory possible. In other words, one should strive for the most simple explanation or theory. However, in the history of philosophy, this razor has been utilized out of its original theological context. In the original spirit of Ockham's Razor, he regarded the essential pluralities and variables to be reason, experience, and the authority of scripture and of God. Thus, his metaphysics, epistemology, and overall philosophy utilizes this razor in referring back to these permitted pluralities, which is evident in his most widely known counter-argument to the problem of universals. The problem of universals held that individuals point to supra-individual universals, essences, or forms—a position held by Plato's theory of the forms among many others. Instead, Ockham maintained that only individuals exist, and that universals are the products of abstraction from individuals by the human mind and have no extra-mental existence. Ockham himself asserted that names of an object do not point to an independent essential form, rather that they primarily exist as a mental concept, then as words, following the trend of conceptualism as well as nominalism, for whereas conceptualists held that they were mental concepts, i.e. the names were names of concepts, which do exist, although only in the mind, and nominalists held that universals were merely names, i.e. words rather than existing realities. He maintained that the existence of such universals would constrain God's creative process and would likewise limit the power of God and were an unnecessary plurality in our understanding of existence. Ockham is also increasingly being recognized as an important contributor to the development of Western constitutional ideas, especially those of limited responsible government. The views on monarchial accountability espoused in his Dialogus (written between 1332 and 1348) greatly influenced the Conciliar movement and assisted in the emergence of democratic ideologies. In logic, Ockham worked rigorously towards what would later be called De Morgan's Laws and considered ternary logic, that is, a logical system with three truth values—a concept that would be taken up again in the mathematical logic of the ninteenth and twentieth centuries. Summa logicae (Sum of Logic) (before 1327), Paris 1448, Bologna 1498, Venice 1508, Oxford 1675. Quaestiones in octo libros physicorum, (before 1327), Rome 1637. Summulae in octo libros physicorum, (before 1327), Venice 1506. Quodlibeta septem (before 1327), Paris 1487. Major summa logices, Venice 1521. De sacramento altaris and De corpore christi, Strassburg 1491, Venice 1516. Dialogus, (begun in 1332) Paris 1476. Lyons 1495. Breviloquium de potestate tyrannica (1346). De imperatorum et pontifcum potestate [also known as 'Defensorium'] (1348). Kilcullen, John, and George Knysh. Ockham and the Dialogus. Eprint, 2002. Retrieved August 17, 2007. Knysh, George D. "Biographical Rectifications Concerning Ockham's Avignon Period." Franciscan Studies 46 (1986), 61–91. McGrade, A.S. William of Ockham. A Short Discourse on Tyrannical Government. John Kilcullen (trans.). Cambridge University Press: Cambridge, UK, 1992. Peirce, C.S. "Early Nominalism and Realism" (MS 158). Lectures on British Logicians from the Harvard University Lectures of 1869–1870. Peirce Edition Project (eds. ), Eprint, 1869. Retrieved August 17, 2007. Peirce, C.S. "Ockam" (MS 160). Lectures on British Logicians from the Harvard University Lectures of 1869–1870. Peirce Edition Project (eds.). Eprint, 1869. Retrieved August 17, 2007. All links retrieved August 5, 2013. William of Ockham biography at University of St Andrews, Scotland. Dialogus, text translation and studies at British Academy, UK. History of "William of Ockham"
This page was last modified on 5 August 2013, at 19:38.